Your resource for all things shoegaze and dream pop: Tender Age: Special 12-inch Release + New Video + EP Review. Tender Age: Special 12-inch Release + New Video + EP Review. We published Part One of our interview with Portland, Oregon quintet Tender Age just as their EP Disappear Here was released digitally and on cassette. Since then I’ve had the opportunity to immerse myself the cassette edition. I found myself playing it twice a day or so for four or five weeks running, sometimes waking up with hooks or stray bits of sound echoing insistently in my mind, pressing me to play the tape again. I quite simply love the EP, which consists of gleefully, painfully torqued and deconstructed songs whose thoroughly appealing pop core nonetheless shiningly asserts itself amidst all the noise, distortion, and mercilessly wrenched arrangements. Given all the noise Tender Age has loaded into their pop, it’s remarkable that the pop is preserved. The band has struck a remarkable balance between pop savvy and inspired destructiveness. Disappear Here builds on the girl-group-inflected dream pop of the band’s 2014 “Anything”/”Mirrors” 7-inch and the classic shoegaze of last fall’s “Get High”/”Always” 7-inch by additionally embracing a big wallop of Nineties noise-rock chaos. It's a fizzing, vertiginous blend that couldn’t be a better match for my own musical enthusiasms. Sonic transitions of various kinds bridge the tracks so that each side of the cassette plays as a continuous stream of sound. Speech, most of it appropriated, is a prominent component of of the overall mixture. Threads of spoken word and snippets of prattle from film or broadcast media are woven into the background or come to the fore quite frequently. What’s surprising is how well this plays. At first I guessed that such a generous helping of this kind of material might start to wear thin with repeated listening. Rather, over time, the various strands of speech in the EP—at least for me—refresh themselves by seeming to yield different texts and new resonances. This morphing and deepening of meaning is enabled by the fact that the selections, while often playful and sardonic, also evoke inexhaustible themes like tragic loss and the deeper nature of the self. Even in protracted heavy rotation, Disappear Here continually reveals new facets and fresh pleasures. The first side consists of three originals. We premiered the opening track, “Lowers”, in February here, and you can watch the brand-new video for it, put together by Tender Age guitarist Christopher Klarer, below. The title of the second track, “Delirium”, speaks rather well for itself. Side A’s closer, “No,” might be my favorite of the three originals. It’s a fractured waltz of disappointment and disaffection—Elaina Tardiff sings “Oh, I’m underwhelmed/The future should have been so much brighter and more fair/Oh, these days I walk around//Looking for my face in the window/Of this market price/apartment complex”—that offers a pleasing melody to sing along with over the sonic carnage. As much as the sonic vocabulary is one of contorted guitar screeches, bursts of tortured noise, and dark hazes of sound, the band still delivers on pop essentials like memorable lyrics, catchy choruses and melodious earworms. Side B consists of three covers. The first is a stretched-out torquing of Bobby Darin’s originally snappy 1959 mega-hit “Dream Lover” (see Darin perform it live on TV here). Tender Age sets the song’s wistful romantic aspirations among twisted guitars and eerie background vocals. Next up is “I Love How You Love Me”, first released by the Paris Sisters as a 1961 single that gave seminal girl-group producer Phil Spector one of his earliest production hits. Tender Age gives the tenderly sentimental lyrics a somber, almost dirge-like dual recitation (the original also features a recited portion) by Tauna Leonardo and Elaina amongst spacey noises and washes of sonic abrasion until, as the track immolates itself, a slowed-down sample offers a taste of the original’s melody and arrangement. As the embers die out, a lovely Enoesque ambient loop emerges. We may easily be expecting an ending to the EP any second here, but after more than two minutes of soft ambient unspooling comes a sixth, unlisted and unidentified track that doesn’t show up in the EP’s digital version. Out of respect for the mysteriousness around its appearance on the tape, I won’t identify this third cover. I will say that the song first appeared twenty years ago with an utterly Spectoresque girl group sound, and that on several levels its presence here deftly wraps together the Sixties and Nineties influences that Disappear Here celebrates and bends to its own purposes. And somehow, the basic charm of all three of the songs covered is still in evidence despite the frenzy of contortion and ironic ‘tude to which they’ve been subjected—no small achievement. Tender Age is presently on tour. In the coming days and weeks they’ll be hitting seventeen Midwest and East Coast locations, followed by a homecoming show in Portland on September first. We posted the dates here. 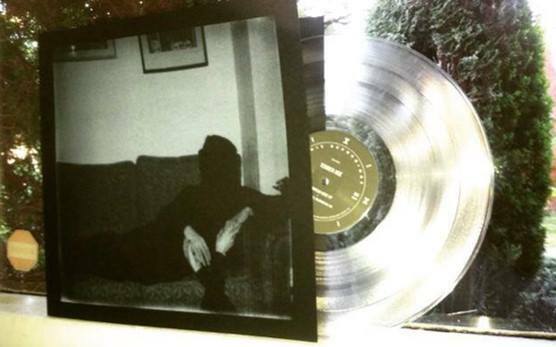 In conjunction with the tour, Sinis Recordings is releasing a very limited 12-inch vinyl edition of Disappear Here. It’s on clear vinyl and all the covers are screen printed by hand. Only a few copies of the 12-inch will be available at each tour stop; the same goes for a very limited cassette split with Portland allies Toxic Slime. For those unable to make it to any of the tour dates, a very small number of the 12-inch discs will be made available on a first-come, first-serve basis this Friday, August 5th, at noon Pacific time. You’ll be able to buy it through this Sinis Recordings Bandcamp page, where the cassette and digital editions of Disappear Here are for sale on an ongoing basis. Watch this space for Part 2 of our interview with Tender Age in the coming days.